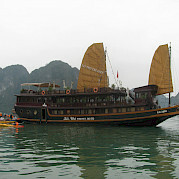 Each ship has a saloon/dining room and a sundeck/bicycle deck. Most cabins are double cabins with some also serving as 3- and/or 4-person cabins. 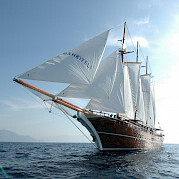 Bahriyeli A Turkey, Greece Premium Class Boat On the Turkish coast, a Bahriyeli is a synonym for greatest possible comfort and best material. 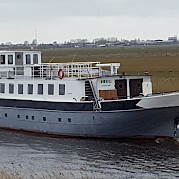 Fiep Netherlands Premium Class Boat The Fiep was converted from a cargo ship into a modern and spacious passenger ship, specifically designed for bike and barge tours in the Netherlands and Belgium. The ship has recently been renovated. There are two decks on board. On the upper deck is a lounge, a spacious seating area, a cozy bar, and a large sundeck. The dining room is located on the lower deck. 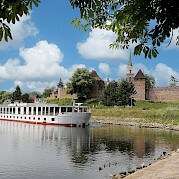 Fluvius Belgium, Netherlands Premium Class Boat The MS Fluvius accommodates 44 guests. The salon with a bar is a large room for common use and has a semi-separate restaurant area. 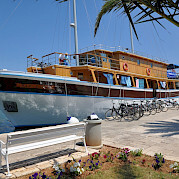 On the large, and partially roofed sun deck of the 70-meter long ship are comfortable tables and chairs along with a storage room for the bikes. 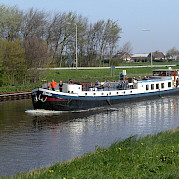 The ship sails under the Dutch flag and has been sailing in Holland and Germany for many years. 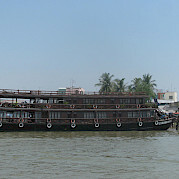 Le Cochinchine Vietnam Premium Class Boat The Cochinchine is one of the largest and most modern ships in the region. It's shape is reminiscent of the vessels of the famous river delta in southern Vietnam. This comfortable wooden boat is protected by the watchful dark eyes of the red dragon painted on the prow. Three times a day, the large common room becomes the dining room with beautifully set tables. Love Boat (formerly BB2) Turkey Premium Class Boat The Love Boat has all the amenities and the elegance of an exclusive yacht. While sailing or mooring, the sun beds spread out on the deck will offer you an excellent opportunity to sunbathe and relax. The professional and experienced crew ensures the safety and convenience of all guests. Enjoy the sea from the comfort of your home. MS Florentina Czech Republic Premium Class Boat The MS Florentina was originally built in 1980 and has been refurbished twice since. It offers a bright, friendly restaurant with bar, lounge, observation saloon with panoramic windows, and a large sun deck with deck chairs for sitting and river watching. 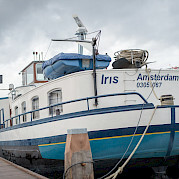 Olympia Netherlands Premium Class Boat On this comfort plus vessel, you will enjoy wonderful amenities while biking in Holland, a cycling paradise! 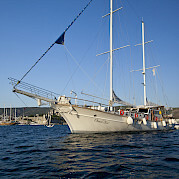 Osman Kurt Greece Premium Class Boat The Osman Kurt is an beautifully designed, 32-meter Gulet made of wood that has been crossing the sea since 2000. It was rebuilt in 2007 and features seven comfortably furnished guest cabins. The cabins, four with double beds and three with twin beds, are situated near the comfortable lounge for your relaxation. All cabins are equipped with a bathroom, a shower / WC , and air-conditioning. Numerous reclining options offer plenty of space on the sun deck for you to relax while sailing, giving you time to sit back and enjoy the view! The friendly crew do their best to provide you with a trouble free trip.